Anne Thomas with a patient at Dolgellau Hospital. Don’t be put off by the process. It was enjoyable and useful as it benefited us as a team to write about the initiative in a constructive and logical way. It was also made much easier by the contact we had with the organisers. Emails and telephone calls were answered quickly in a friendly and helpful manner, and we were always aware of and prepared for the next stage of the awards. I travelled a long way from my workplace at Dolgellau Hospital in north Wales to meet the judges and present our project. The interviews were handled in a calm and efficient manner, which helped reduce anxiety. The presenting facilities were well organised and the judges were welcoming, encouraging the best from the presentation. Then on the day of the awards ceremony finalists are invited to a special afternoon session to meet the other finalists and judges before the evening event. It gave me the chance to learn about the excellent work of others in my category and was also a good chance to meet the category sponsors and to provide them with the background to our initiatives. The ceremony itself was spectacular. The organisation could not be faulted, from the reception to the food and the dancing at the end. Receiving the award was truly unexpected for our team. When our name was called, we could not believe it. The overwhelming feeling for us all was immense pride for winning, but we also felt incredibly proud to be part of the nursing profession. Winning has certainly raised the profile of our initiative. The local press featured our award and local councillors and community groups, as well as patients, became more aware of our approach to health education in outpatients. This is particularly important for a health education initiative. Raising awareness of the ways people can help their own health and well-being improves the effectiveness of the approach. As people have become more aware of our health education approach in the outpatients’ department, we have been invited to give presentations at meetings, conferences and health events. Betsi Cadwaladr University Health Board is very keen to extend our strategy to other community hospitals in north Wales. We have also been invited to give advice on testicular and prostate cancer to men in the new Berwyn Prison in Wrexham. Our most recent focus has been on men’s mental health. We have identified a real need for support for farmer’s mental health in particular, as they have the highest rates of suicide in men. We have formed links with the Farming Community Network, which provides a helpline for farmers who are distressed, providing practical support. We have raised money to get the literature printed in Welsh and have been overwhelmed by the support from the whole community. A network of police community support officers are taking the helpline cards and posters out into the community and making them available in farmers’ markets, banks, vets and pubs. The police firearms team and rural crime team are also sending out cards to every farmer they have contact with and advertising the helpline on social media, and I have been asked to give a presentation on our work in men’s health to a farming conference. Health education must be available whenever and wherever it is needed. I believe that winning the award has encouraged our community to support us to achieve our aim of reducing inequalities in men’s health in a rural community. Anne Thomas led a health education initiative to address inequalities in men’s health in her community. Her research identified barriers the rural community experienced in accessing health education. With her team, she consulted individuals and groups to find acceptable and accessible ways to engage men. 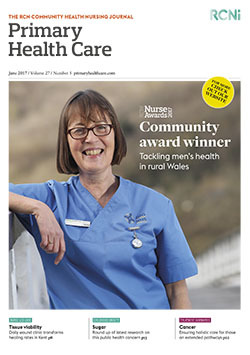 Plans were developed with colleges, workplaces and GPs, and initiatives included prostate symptom drop-in clinics and awareness sessions for community groups in pubs. There is also a healthy heart programme offering one-to-one support, testicular cancer awareness sessions in schools and colleges, and sun awareness sessions for farmers at cattle markets.